The following is a translation of an official statement made by the Armenian Ministry of Defense on April 4. The translation was done by journalist Maria Titizian. The Defense Ministry (MOD) of the Republic of Armenia attaches great importance to the reaction of the international community and their calls to the sides of the conflict. The MOD of Armenia stresses that the Republic of Armenia is the guarantor of the security of the people of NKR. At the same time, as a side that is not involved in the military operations, the MOD of Armenia appreciates that the calls to end the hostilities have been directed to Azerbaijan and Nagorno Karabakh – the two sides involved in the conflict. Being in agreement with the calls to the sides to end the hostilities, the MOD of Armenia wants to call the attention to the international community of the fact that aside from political statements to restore the ceasefire regime, it is necessary to bring to an agreement and realize concrete means; develop the technical conditions of a ceasefire, implement the removal/separation of the forces and restore the mechanisms for the ceasefire regime. At the same time, the RA MOD wishes to bring to the attention of the international community that the military operations unleashed by the Azerbaijan side is in violation of the 1970 Declaration on Principles of International Law concerning Friendly Relations and Co-operation among States in accordance with the charter of the United Nations, the 1976 OSCE Helsinki Final Act and a number of other international legal documents. During the military operations realized by the Azerbaijani side against the defense forces of Nagorno Karabakh and civilians, there have been numerous acts similar to the tactics used by international terrorist organizations, which according to international humanitarian law, are considered to be military crimes. Those include torture of non-combatants and prisoners of war, including even beheadings, mutilation of corpses, etc. Those acts have been photographed and displayed with the objective of terrorizing people. The RA MOD announces that the Azerbaijani authorities and all those responsible for the violations of international law and war crimes will be brought to justice, including by the international community. Is Nagorno-Karabakh Caught in a New War? A new armed struggle to maintain the integrity of the Nagorno-Karabakh Republic began in the early hours of April 2. Azerbaijan has admitted that it launched an all out attack long the line of contact with Nagorno-Karabakh, although Baku has subsequently denied that. Many of us following the events during the last few days have been frustrated by the lack of information from the front lines. Often the same news was reported for eight hours or more on Facebook and Twitter feeds by users based in the region, most notably the supposed ceasefire initiated by Azerbaijan that proved to be disinformation. Official statements from the Nagorno-Karabakh government reveal the number of soldiers dead as well as the amount of destroyed military equipment. Until late April 3 few professional photographs taken along the line of contact were circulating in the press. Amateur as well as some professional video footage taken from a distance was also posted on various news sites. Contrary to earlier reports Azerbaijan has demonstrated that it has no intentions to initiate a ceasefire. The Nagorno-Karabakh defense ministry reported that massive shelling along the line of contact is continuing. In northern Karabakh Azeri forces are reportedly retreating and vital strategic positions have been recaptured by the Nagorno-Karabakh military. 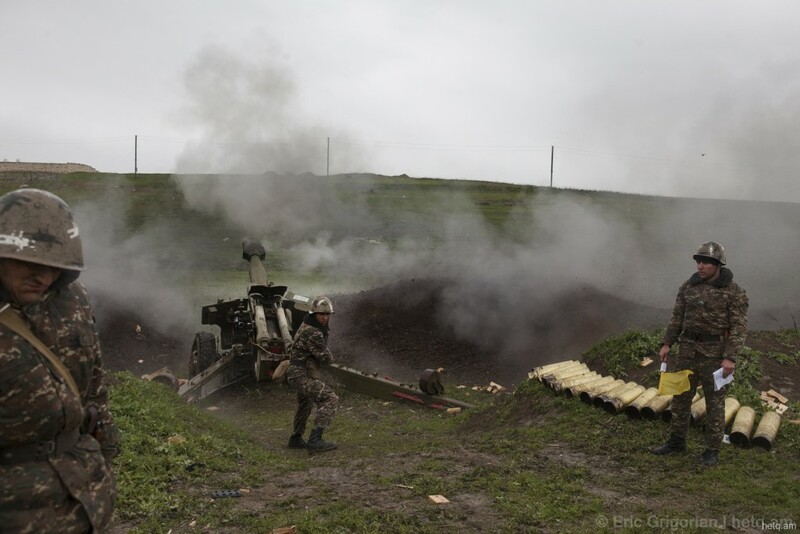 Azerbaijan is continuing its offensive with “mortar and grenade attacks” all along the frontlines with the southeastern and northeastern points taking the brunt of the assault. Other equipment used in the assault include 152 mm cannons, Grad missiles and tanks. The town of Martakert in the northern part of Nagorno-Karabakh, which resides virtually on the line of contact with Azerbaijan, was severely shelled throughout the day on April 2. Nagorno-Karabakh forces have reportedly destroyed a total of 4 drones, two helicopters, 21 tanks (estimated) and multiple armed vehicles. Nagorno-Karabakh has reportedly lost one tank and three military trucks. On April 3 Karabagh officially claimed six wounded, including two children, and four dead civilians, including one child. Hetq Online reported that in Martakert Azeri soldiers killed an elderly couple in their own home and cut off their ears. It is not clear whether that couple was factored in the official number of deaths. Official numbers on April 2 were 18 soldiers killed and 35 wounded, according to Armenian President Serzh Sargsyan. As of this writing there are no new reports of casualties. US Congressman Adam Schiff (D-CA), Brad Sherman (D-CA), Robert Dold (R-IL) and Frank Pallone (D-NJ) have condemned Azerbaijan’s aggression in official statements. The Organization of American States (OAS) has also condemned Azerbaijan. Russian Foreign Minister Sergey Lavrov is purportedly working on a new plan to cease the hostilities. The Co-chairs of OSCE Minsk Group is due to meet today—we can expect a statement from them by the evening or on Tuesday. This is by no means a comprehensive list of updates. Let’s be clear: this is a new conflict. This fighting is not a violation of the 1994 ceasefire brokered by Russia; it demands a new legally binding agreement to end the hostilities. And although there have been skirmishes along the line of contact over the last 20 years, with even micro-battles being waged on occasion, there has been relative peace between the Nagorno-Karakakh Republic and Azerbaijan. This is essentially a new war—if we can indeed call it that only three days in. The Azeri offensive should not be seen as a “frozen conflict” suddenly thawed overnight. I have not seen an official declaration of war from either side. The Nagorno-Karabakh forces have been on the defense by holding the line and reclaiming posts that had been taken by the Azerbaijani army “blitzkrieg,” as it’s been described by the Armenian press, of April 2. For two days I refrained from writing about these clashes. Although I don’t think I’m alone in having expected a new conflict to erupt, the sudden events of the weekend have certainly been surreal given the relatively peaceful situation of the last 20 years.